What is an air purifier? How does air purification work? What is an air purifer? An air purifier is a device which captures air pollutants… Fine. Let’s dig into further details! The true term should not be “air purifier”, but rather “air treatment unit”. No affordable mass-market device can produce “pure air” (what would it mean, by the way? ): there will always be some level of pollution inside. But an “air treatment unit” can help to remove pollutants from air. Gas are more or less dangerous depending on their quantity. For instance, Ozone (O₃) is rather a useful gas in small quantities (it destroys microbes), and natural air contains some of it. But when it is too dense, it irritates eyes and respiratory ways. Also, CO₂ at a “normal” rate (0.04%) is perfectly acceptable, but when it reaches 0.1%, it becomes disturbing: it induces a sleep of low quality, etc. artificial gas in micro quantities, which may be harmful. They are generated by the chemical products that we daily use. Particulate matter is composed of “big” elements, so the best way to remove them is to push them into a nest called HEPA filter. The nest can be more or less thin depending on what it is supposed to capture. With each air pass, a certain proportion of particulate matter will be blocked. Ideally, at the end, there are no more particles. Chemical pollutants are far smaller. It is impossible to capture them with a physical nest, so they require molecular sieves with a huge surface on which molecules will be adsorbed. After all, this is precisely the way used by the lungs to capture oxygen! 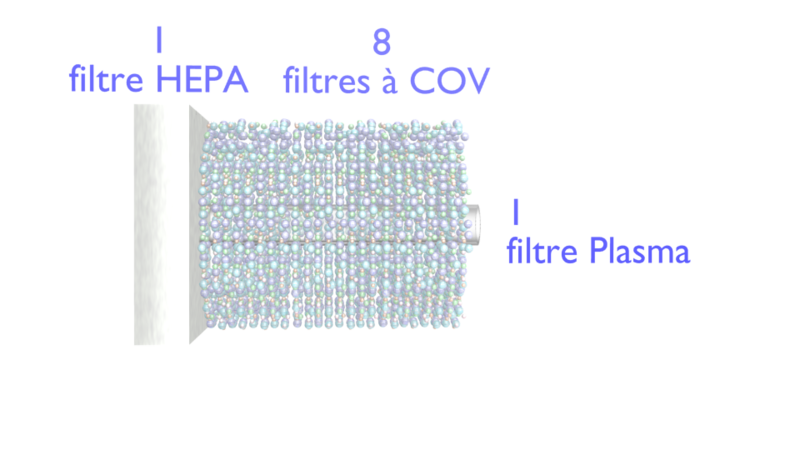 The various purifiers use different kind of surfaces, which attract some pollutants. The main issue is that the pollutants are pretty loosely attached to the surface, so they may be released with any change of temperature or humidity. Air Serenity solved these issues, on the one side with a blend of surfaces which capture numerous distinct pollutants, and on the other side with a plasma-based technology, which will degrade and oxidize pollutants and link the remaining parts strongly onto the surface. Virus and bacteria have very variable size. It is not smart to capture them “alive” in one purifier: they would make the device very dangerous. So the best way is to block them temporarily and deactivate them. This is also what the plasma is made for. It enters homes from the cellar, and moves into the house trough the ducts or wall holes. Capturing radon is not reasonable: the capturing unit would become radioactive, and it would not make things better. The easiest way to get rid of radon is to dilute it with fresh air: a good aeration will solve the problem. Indoor air or outdoor air? Indoor air only! Filtering outdoor air is useless. The volume of outdoor air is so huge compared to the volume of indoor air! If human beings were equally placed on the earth surface, each of us would occupy 70 000 m². It clearly appears that it’s more efficient to deal with the 20 m² of an 3 meter high bedroom rather than the 70 000 m² of open space with 10 km of height!